February 20, 2015 October 28, 2017 Mike Ivancie, Esq. become a permanent employee of the district. deemed reelected for the next succeeding school year. Can you explain that law in plain English? The law provides that if a probationary teacher is employed by the district for two consecutive years they will become a permanent (tenured) teacher at the start of their third school year. The district can decide not to reelect a probationary teacher in the first two years of the probationary period. However, they must do so by March 15th of the last probationary school year. If the district does nothing (doesn’t notify the teacher of non-reelection prior to March 15th) the teacher is deemed reelected for the following year. What are the core principles of that statue in visual form? So what reasons does the district have to give for not reelecting me? Actually, none. If you are a probationary teacher the district can decide not to reelect you for any or no reason at all. All they have to do is get you the notice of non-reelection before March 15 of your second complete school year as a certified probationary teacher. California courts have recognized the great discretion districts have in this regard: The public school district has “the absolute right to decide not to reelect probationary teachers without providing cause or other procedural protections.” Sunnyvale Unified School District v. Jacobs, 171 Cal. App. 4th 168 (Ct. App. 2009). Contrasted with the great amount of protections for permanent teachers it certainly does not seem fair. But this provisions allows districts to weed out underperforming or apparently troubled teachers before they become tenured, and it is much more difficult to fire them. The California Court of Appeals has openly acknowledged this balance “[t]his seemingly draconian provision [talking about § 44929.21(b)] represents the Legislature’s balance between the rights of the teacher and the overall purpose of the system of public education, which is to educate the young.” Sunnyvale Unified School District v. Jacobs, 171 Cal. App. 4th 168 (Ct. App. 2009). Well your options are somewhat limited. Since the district has the absolute right not to reelect you while you are a probationary employee, it is very difficult to challenge a non-reelection. Collateral challenges to non-reelections through a claim of protected whistleblowing activity are not always viewed favorably by the courts. See, e.g., Conn v. Western Placer Unified School Dist., 186 Cal. App. 4th 1163, 113 Cal. Rptr. 3d 116 (Ct. App. 2010) (“to exalt these ‘disclosures with whistle[-]blower status would create all sorts of mischief. Most damagingly, it would thrust the judiciary into micromanaging employment practices and create a legion of undeserving protected `whistle[-]blowers’ arising from the routine workings and communications of the job site.”). For courts to accept whistleblowing claims the disclosures need to be of significant magnitude including violations of state or federal law. Claiming that your non-reelection is based on discrimination, say for your sexual orientation, can sometimes be grounds for getting a decision reevaluated or getting concessions from a district. However, discrimination cases are extremely fact dependant. Ultimately, each case is different. Non re-elections are difficult to challenge; it is an uphill battle. However, if you think your non-reelection was a result of protected whistleblowing activity or discrimination you should contact an attorney. Contact us for a free consultation. 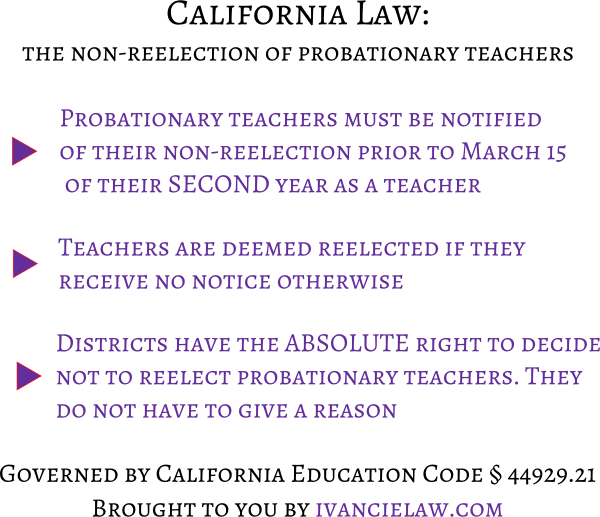 Probationary teachers have drastically limited rights when it comes to non-reelections. If you are a teacher that has been notified of your non-reelection you may want to pursue a resignation in lieu of non-reelection. Districts have broad discretion when it comes to reelection. So, in some cases, rather than trying to fight a reelection it may be better just to move on and find employment elsewhere. If you do want to challenge a non-reelection you need to consider whether your non-reelection was based on your membership in a protected class or a protected disclosure you made. October 14, 2014 October 28, 2017 Mike Ivancie, Esq. What every federal employee facing discipline should be familiar with: The Douglas Factors. This article covers the Douglas Factors. The Douglas Factors (wiki) are comprised of 12 different points of analysis which a federal manager must consider when they act as a deciding official in a discipline case. This guide has been prepared by an attorney with extensive experience practicing before the MSPB, both as a representative of federal agencies, and as a representative of federal employees. If you are a federal employee facing discipline, this article can help you understand what factors your managers are contemplating as they make a decision on your case. Knowing what managers are looking for will aid your oral reply presentation, and could be what saves you your job with the federal government. If you are a federal manager reading this article, it will help you understand the kind of analysis you should be engaging in when you apply the 12 Douglas Factors to the specific facts of a discipline case. After reading this guide, if you want to read further on the topic of federal employee discipline, you may find our guide to MSPB and discipline cases helpful. If you are a federal employee facing discipline, as you read this article you should be thinking about the which of the twelve Douglas Factors are in your favor, and how you can present evidence to support your position on those factors. A well presented reply to the proposed discipline can lead to substantial mitigation. In short: if you’re facing removal leveraging the 12 Douglas Factors the right way could save your job. The Douglas factors are probably the most important factor in determining the outcome of any federal employee’s discipline case. Yet surprisingly, most non-managerial federal employees have no knowledge of these important factors until they themselves are facing discipline. By contrast, the Douglas Factors are well known by managers because they have to reference and articulate how those factors interplay with the specifics of every disciplinary case they preside over. The Douglas factors come from a seminal employment case titled, Douglas v. Veterans Administration, 5 MSPR 280 (1981). In that case, the Merit Systems Protection Board laid out the twelve factors that need to be considered in any federal employee’s discipline case. If you want you can download and read the full Douglas v. V.A. MSPB decision. Now, lets take a closer look at each factor individually. The first factor looks at the severity of the misconduct and how it relates to the position the employee has. For example, a law enforcement officer is charged with enforcing laws. So, if they have been convicted of violating the law, say stealing, this factor will likely cut against them and lead to a more severe penalty. Additionally, this factor looks at intent. Negligent or accidental incidents will be viewed more favorably than intentional acts. Not only the first, this is also the most important Douglas Factor, as the MSPB has directly stated that “the most significant Douglas factor is the nature and seriousness of the misconduct and its relation to the employee’s duties, position, and responsibilities, including whether the offense was intentional or was frequently repeated.” Luciano v. Department of the Treaswy, 88 MSPR 335 (MSPB 2001). This factor looks to the status of the employee. If they are a manager or in a position of great trust any transgression is likely to be viewed more harshly. If you are low level employee with no supervisory functions this factor should have some mitigating value. The thrust of this factor is that the more prominent the position, or more trust and power you hold in the position, the more seriously the agency is going to view any misconduct you engage in. With responsibility comes greater obligation and scrutiny. This one is pretty self-explanatory. If you have been disciplined before you will face harsher discipline going forward. The idea is that discipline is meant to be corrective and progressive. So, if you do not conform your conduct after being disciplined the first time the penalty will be increased in hope that the misbehavior will cease as you respond to harsher discipline. Most importantly, employees need to be aware that once they have a disciplinary record, it makes defending new discipline cases much more difficult. Note that: accruing multiple instances of discipline can lead you on the fast track to removal from federal service. Important things to consider for this factor are how long you have been employed by the federal government generally, and your agency specifically (if you were previously in the armed forces or worked for another civilian agency). Also any awards or accolades the employee has would be mitigating in nature. Additionally statements from managers or co-workers as to your ability and integrity will be helpful. This factor deserves some detailed explanation since it is one of the less self-apparent of the factors. Essentially, this factor asks: was the offense committed one that calls in question the employees ability to continue performing his job? If you’re a law enforcement officer and you have been convicted of assault it is likely that your supervisor will lack confidence in your ability to follow and enforce laws–which cuts to the very core of your duties as a law enforcement officer. Another example would be an employee who holds a position as a clerk where they regularly handle money deposited by the public and are responsible for balancing small accounts. If that clerk is then caught stealing from another employee or scalping a few dollars off of each days transactions, that would clearly call in to question his ability to perform as a clerk going forward. Consistency of the penalty is shorthand for: is the action we are taking in your case the same or similar to other cases with similar facts. The key inquiry here is whether like and similar cases have resulted in close-to-the-same discipline you are facing in your case. Lets say you missed a deadline for an important assignment and management has proposed removal. But you know one of your colleagues has recently missed a deadline of similar importance and was only issued a letter of reprimand. All other facts the same, you would want to point this inconsistency to management’s attention because it is clear the two penalties are not consistent with each other. Many agencies have tables of penalties and offenses that list common offenses and their typical discipline ranges. You should review the table to make sure that your discipline is in keeping with this table. If the proposal in your case is grossly above the range suggested in the table it is imperative that you point this to management. This table should be available to you as an employee. Management has likely even required you to review the table and sign a form asserting your knowledge of it. This is because it puts you on notice of the penalties which is factor #9, below. The more notorious the offense you commit the more severe the discipline you will face. So, if your case was publicized or brought shame and negative attention to the agency you can expert a more severe penalty. A good example of negative notoriety are the recent cases involving Secret Service Agents that hired escorts in South America. The national media picked the story up, and it was very detrimental to the agency. Moreover, I believe most, if not all, of the employees involved were removed or resigned from federal service. This factor basically asks: Did you know, or should you have known, that what you did was wrong and that you would be punished for engaging in that kind of conduct? If, for example, management had sent a memo to all employees explaining the rules and potential discipline for the personal use of office supplies and then two weeks later your took three reams of paper and a stapler home with you, management would have a strong argument that you were on notice and still engaged in the misconduct. The more notice you have of the prohibition on certain conduct the stronger argument management has for issuing discipline if you engage in that misconduct. A big question managers have to ask themselves is: after the misconduct that has occurred can I confidently bring the employee back? To some extent, this is a subjective question. In some instances, however, an employee’s misconduct will be so severe its obvious they can’t be rehabilitated and brought back on the job. This is a very fact specific factor and will depend on the manager’s opinion as much as the employee’s misconduct. One way to sway this factor in favor of an employee is to be contrite apologetic and to admit the misconduct you engaged in. If an employee is unwilling to even take responsibility for their actions, how can a manager be confident they will be rehabilitated after they are disciplined? This factor lends itself most to employees arguing for leniency in their case. Any personal issues going on around the time of the misconduct should be brought to the attention of management. If you were going through a divorce, your child was hospitalized, or a family member had passed away, you should be explaining these mitigating factors to management. Ultimately, managers are people too. They likely held the same job you hold at some point in the past. They know the stress of a career, they know how life can be difficult. If you can present concrete and credible evidence of such mitigating factors, it will go a long way to helping your cause. This factor is generally an afterthought for both management and employees. However, if you properly argue this factor it can go a long way towards helping your case. Let me give you an example. Lets say you are facing a long suspension for showing up late to work for a long period of time because you are a recovering alcoholic and fell off the wagon for a few months. If you present evidence to management that you are enrolled in AA and also let management know you are willing to agree to provide evidence of your continued attendance or proof you are engaged in other counseling, management may find that satisfactory on its own. You won’t know unless you make it a point of conversation, but in many instances its worth the effort to approach management with creative alternatives, since there is very little downside. Reviewing these twelve factors in a vacuum is not useful to you as an employee, or to managers who are trying to make a decision about a specific disciplinary case. That is why its important to use these factors to analyze the facts of each individual case–where the rubber hits the road. For the employee, how you articulate and present the facts of your case greatly affect how management applies the Douglas Factors. These terms are used commonly in Douglas Factors application. A mitigating factor is one that suggests the discipline be mitigated, or lowered. An example of a mitigating factor would be having no prior discipline in a 20 year federal career when applying Douglas Factors #3 and #4. Conversely, aggravating factors are those that suggest the discipline be sustained or even increased. An example of an aggravating factor would be an employee who has been previously discipline for the same misconduct two times within the last year. So how do I use these factors? Every case is different, so sometimes factors that really stand out in one case, have little to no significance in another. For example, if an employee has no past disciplinary record, factor #3 doesn’t hurt the employee, and can actually become a mitigating factor. In contrast, an employee with multiple prior cases of discipline is likely to face a much greater amount of discipline owing to that factor alone. Each Douglas Factor can work for or against an employee depending on their specific case. You need to look at the specifics of your case in light of the twelve factors. Go through each Douglas Factor and try to write down points that are in your favor and points that are not in your favor for each one. After you have this list it should become pretty clear to you which Douglas Factors you want to focus on with management. Once you have a few key factors you should try to collect any supporting evidence that may be helpful, like doctor’s notes, proof of counseling sessions, etc. Employees should be aware that managers sometimes use a ‘Douglas Factors Checklist‘ that helps then analyze and consider each factor. Therefore, you should anticipate factors the deciding official may focus on and structure your presentation accordingly. It is important that you really highlight the factors that are in your favor. Federal disciplinary cases are difficult and costly to fight, and the Merit Systems Protection Board is not the most favorable forum for federal employees. If you follow this guide, and focus on the factors that support your position, and provide credible evidence in support of your points, you will have gone a long way towards lowering the amount discipline you will receive. What if I do not agree with management’s analysis of a specific Douglas Factor? Sometimes management may misapply factors, or misconstrue them. Your job as an employee is to support your position as best as you possibly can. In some instances this may mean pointing out points of analysis or facts to management if they are unaware. Other times it may mean providing some evidence to management to further support your position. Regardless, try to avoid getting into an argument with management over factors. Remain calm, deferential and respectful at all times. This means you should provide objective facts to support your arguments if you can. For example, lets say you are arguing that there are mitigating factors present in your case (factor #11) because your child was hospitalized for a full month leading up to your misconduct. Producing a doctors note to management confirming the hospitalization supports the validity of your claim and will be harder for management to overlook than had you just made a verbal assertion of the same. Ultimately, the more credible evidence you can provide to support your position the better. Take factor #4 for example, past work record, if you can get colleagues, supervisors, etc. to write letters for you that attest to your diligence and good behavior at work, that will help tilt that factor in favor of mitigation. In every discipline case there are going to be facts that likely hit on a specific Douglas Factor and really cut against the employee. How do you handle these aggravating factors? The key is credibility. Do not deny the existence of bad facts. But do not highlight them either. Be clear, terse, and apologetic. A manager is much more likely to mitigate the discipline of an employee who admits wrongdoing but is honest and apologetic then they will for an employee who tries to deny misconduct and appears dishonest or unapologetic. We are all human, we all make mistakes, how you handle those mistakes speaks volumes about your character. Can someone help me present the Douglas Factors to management? If you are a unionized employee, typically someone in your bargaining unit will help you argue your case to management at your oral reply. Additionally, you have the right to pick a representative of your choosing should you not have union assistance available to you, or you wish to hire a different a representative. Hiring an experienced federal employment law attorney for your oral reply can pay for itself many times over. A competent attorney can help you lower your discipline at the early stages of process all together avoiding the expense of litigating your case later. For example, an attorney won’t have to expend nearly as much time preparing a really solid oral-reply than they would expend preparing for a full administrative hearing at the Merit Systems Protection Board. Spending the money upfront on representation at your oral-reply, could save you from spending thousands of dollars fighting your case at the Merit Systems Protection Board. An overlooked fact about the cost of hiring an attorney is that they can actually save you money. If you’re facing a 30 day suspension and an attorney helps you get it lowered to 15 days, they have essentially just saved you two weeks of your pay. In some instances the money they saved you may be less than their fee for taking your case–a great result for you the employee. What if I already had an oral reply and they’ve issued a decision and misapplied the Douglas Factors? In some instances, you may want to request that management reconsider your case. But they may refuse to. If they refuse, your only recourse may be arguing your adverse action before the Merit Systems Protection Board (MSPB). At the MSPB, you, or an attorney you hire, will argue your case and present evidence related to the Douglas Factors analysis. If you can make a strong enough case the Administrative Judge (AJ) may modify or cancel the discipline in your case. The result will turn on the specifics of your case and the procedural posture as well. How the factors will be applied in your disciplinary case depends on the specifics of your case. If you are looking for a representative, note that we are not taking on any cases at this time. When looking for an attorney make sure they have experience handling federal-sector employment cases. Private sector cases are drastically different.